HI! Me COOKIE MONSTER. Me love cookies. And me want to meet you! Me running dis thing where you and a friend can come to Sesame Street to eat Cookies with Oscar the Grouch. No no, me just joking! You get to eat cookies with ME! And me promise, me will share! Just go to DIS LINK to enter! Okay, me be back in 20 minutes or so to answer your questions. (Me have to take a batch of cookies out of da oven! Oh boy oh boy oh boy, me can't wait!) See you soon! DAT WAS FUN! Thank you for da questions and da COOKIES! Cookie, cookie, cookie start with C! This the age old cookie question. Me hear to settle it. It a cookie! Is that like a cookie jar? Me think it important to always share your cookies. Me know it hard to do sometimes, but it da kind thing to do. Me draw the line at Oscar the Grouch's sardine cookies. Can me say more cookies...? Me thought it over. Definitely "more cookies." Me do plenty of exercise and play with me friends! Me stay away from anything in Oscar's trashcan. Otherwise me not picky. That one of me favorites. Me also love Cookiemon Go! Me gotta catch and EAT them all! Wow! Me didn't realize these question be so hard. If me had to choose just one cookie, me would have to pick me Mommy's classic chocolate chippie! Me not have dat one on hand but how about dis one? Me always like to use gingerbread, they very sturdy cookie! Me never sure what he did, but he always around to lend a hand and give me cookie! That just the way me am, but it sure does help! Chocolate chippie! You know what they say...you are what you eat! I love you, Cookie Monster!!! Me love you too, AstronautCheeseCake! You a snack that out of this world! Me need to introduce you to stroopwafel. It wonderful! We celebrating our street's 50th birthday this year! Me can't wait to celebrate with you! Maybe even share cookie with you. Me friends have surprised me with lots of cookies! Sir Ian Mckellan even gave me two cookies! Me love hockey! Puck look like big cookie. Oh me trying to remember...it goes "la di da de dum...la di da de dum..." Oh what is the name of that song? What a muppet? As far as cookie recipe me love cookies from Alan at Hooper's Store or me Mommy's recipe! Of course! We go way back. Me hope we have playdate together soon. Me remember it like yesterday! Me mommy gave me first chocolate chippie cookie. 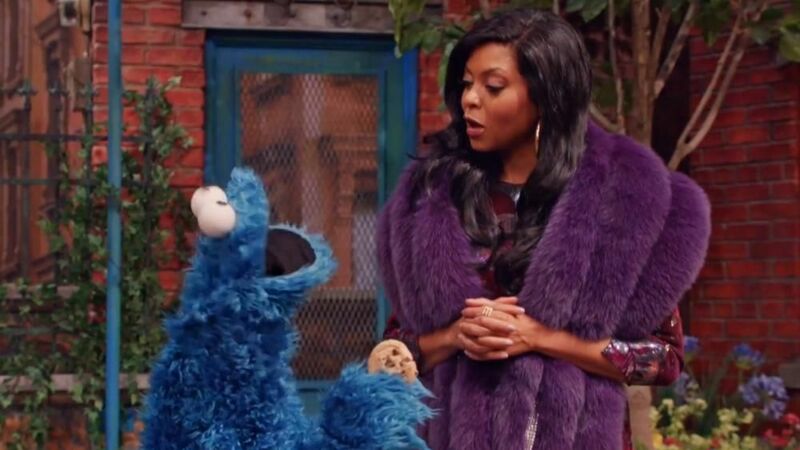 Me ask her to make you some if you come visit me on Sesame Street. Hi Cookie Monster! Do you like your cookies to be softer or crunchier? Me love all cookies. Besides, raisins are nature's candy! Me always be Cookie Monster. Me am what me am. Me love cookies, but me and me friends know cookies are a sometimes food. Me also eat fruits, veggies, and all sorts of stuff. Me monster, me not picky! Me and Julia hang out on Sesame Street all the time! We even spent Thanksgiving together! Me seeing Abby later today, will give her big hug for you! Me would biscuits at tea time with me friend Gonger! Me would love to sing duet with Lady Gaga. Me and me friends are monsters after all. Me hope she see dis! If it chocolate chippie, it the chippies. If it oatmeal raisin, it the raisins. But me always think the most important part of cookie is having enough to share with friends. Me thinks your best bet is to enter dis thing and win. Me fly you here and everything! Me even cashed in all me miles. When I was younger, I came up with a Cookie Monster jingle. Now me have something new to sing in the shower! Me always big fan of snickerdoodle! Hey! Hey! Me still singing and think me sound great! Oh you too kind! Start write-in campaign. Me start writing jokes and acceptance speech. Me come back as long as me don't eat computer. "You may be hungry soon. Bake more cookies!" She great person to share cookie with! Me and me friends go caroling there every year. Me always forget about the icy patch! Hey that me! It LOOK delicious! Me part of the Aveggies! Me hope our next task would be to share cookie or shawarma. Different flavors. Variety da spice of life! Me go with oatmeal raisin! Not all kids, monsters, or Snuffleupagus' like cookies and dat okay. That mean there more cookies for me! Me loves biscuits, tim tams, biscotti, macaron, macaroon, and me even big fan tiramisu! Me make sure to always eat healthy fruits and vegetables. Me want to set good example for me friends on Sesame Street like Elmo, and Abby. Cookies are the perfect dessert after healthy meal, but not every day. Gonger. No Grover. No Abby. No Elmo. Oh, me have so many friends on Sesame Street me can't choose just one. Me favorite number is also eight! As in, "me ATE the cookies!" Me love the fur me in! Oh boy dis list making me HUNGRY! Sharing and being kind to friends. Even Oscar. Me consider it a happy surprise! Me keep it simple - milk! Me hope dat never happen. Me think friends more important than cookies! Me try to keep fur and cookies separate! Me and me friend Gonger are working on baking new cookies in me foodie truck. Me report back with new recipe! Me love playdates with me friends. They always teaching me new games and making me laugh! I just donated, thanks for providing such amazing and educational entertainment to children for so many years! My question - what's your favorite song? Me do lots of monster grooming. It not easy taking care of all this fur! OK, Cookie Monster, tell the truth. How cool is Dan Lewis? I've followed his newsletter for years, and always envied the fact he worked with you. Me and Dan go way back! He the kinda guy you share cookie with! Me still a growing monster! Me learning all the time. Me training to be a chef with me friend Gonger. Me was and will always be Cookie Monster! Me am who me am! Me a happy healthy monster who learn that cookies a sometimes food. Plenty of brushing, and me use plenty of monster-sassoon! Hi-ya Angelique the acorn! Me sending you love and cookies. The thought of losing a cookie hard for me to think about. Why you do dis to me? Me Cookie Monster! Me always be Cookie Monster.